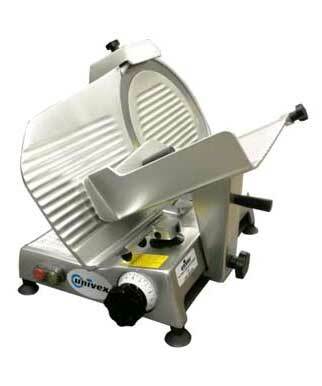 Compact, light-to-medium duty, belt driven, manual gravity-feed slicer. German hollow-ground hardened steel, high-carbon chrome-plated blade. Permanent edge guard. Built-in sharpener. See this model on display at our Sausalito, California Store and Showroom.